Multi-antenna transceiving systems are widely used in high speed wireless communications due to its higher efficiency comparing to its traditional single-antenna counterparts. In this article, the performance effects of some inevitable imperfections are elaborated on multi-antenna transceiving systems. The simulation results are also displayed. An effective method for phase noise elimination is presented and validated using simulation examples. With the growing development of wireless communications in the current society, the conflict between the ever-increasing service requirements of wireless communications and the resource limitation of radio spectrum becomes increasingly apparent [1, 2]. A key technology to solve this problem is multi-antenna techniques, which can enhance the frequency efficiency and link reliability drastically. Compared to the single-antenna communication systems, array gain (i.e., beam forming gain), diversity gain, multiplexing gain, and interference suppression can be obtained by using the multi-antenna communication systems. In recent communication systems, two of the primary multi-antenna techniques are multi-input multi-output (MIMO) and transceiving beamforming. MIMO [3, 4], which is developed based on the smart antenna technology, has its distinct superiority. In the MIMO systems, the wireless channels are independent, or weakly correlated. Due to its abundant multi-paths, MIMO systems could enhance the system capability greatly . The signal processing flow on transceiving beamforming is simple and apt to hardware applications because it does not involve so much prior knowledge and any complicated algorithm. However, the channels' consistency is so rigorous in demand. Thanks to the narrow beam, the performance will be decrease sharply if any direction error exists. According to these disadvantages, some inevitable imperfections will be discussed from four different aspects. In the following section, lots of closed-form expressions are derived and verified by the simulation results subsequently. Considering an N × N transceiving beam formation system, there are also lots of imperfect elements even if the beams between transmitting and receiving ends are completely in the right direction. 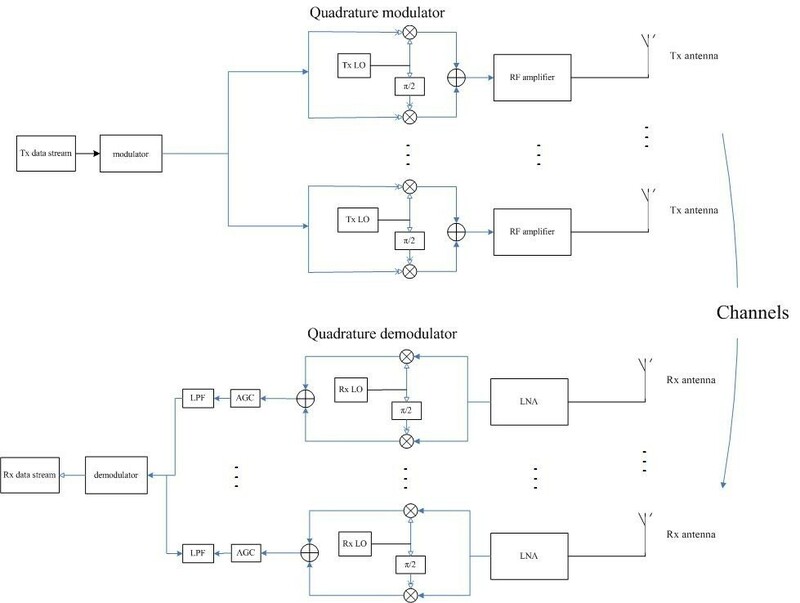 Some of these unsatisfactory factors such as narrowband or wideband amplitude and phase error, the amplitude and phase error in in-phase (I) channel, quadrature (Q) channel, and phase noise, are focused in this article. Each of them is added into the ideal model and discussed, respectively (Figure 1). The system model of multi-antenna transceiver. where h mn represents the amplitude fading and phase difference between the m th transmitting antenna and the n th receiving antenna (Figure 2). The setup of the Tx and Rx antennas. The channel gain is G = 10 · log10P. The noise form in (8) is n nr (t) = LPF〈R n (t)n n (t)〉. Thanks to the especial character, a few approaches are derived to eliminate the error e(n). Gitlin  modeled the phase noise as sinusoidal signal and presented self-adaptation and compensation method named finite impulse response-adaptive line enhancer (FIR-ALE). However, the ability of compensation is limited. Another method, the infinite impulse response-adaptive line enhancer (IIR-ALE)  has obvious effect provided many prior information being known. extended Kalman filter (EKF)  is used to estimate phase noise by linearizing first order digital phase locked loop (DPLL), in which, however, the non-convergent condition happens sometimes. In this article a more accurate method is adopted which is called angle-offset least mean square (AO-LMS). 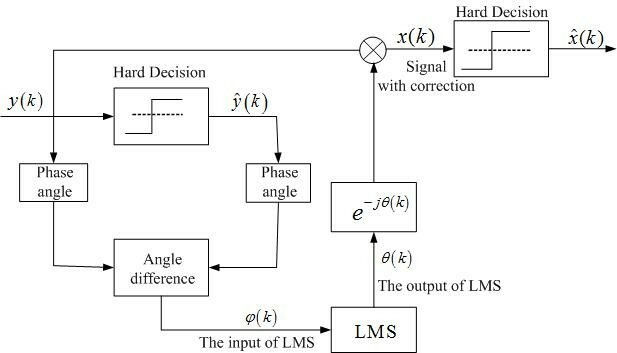 As shown in Figure 3, the angle difference between input signal and its hard-decision results is used as the input of LMS to estimate the real phase noise. As an improvement approach to FIR-ALE, the input of LMS algorithm is a more accurate input, which is closer to the real phase offset caused by phase noise. It means a clearer aim and a better compensation ability. The four errors introduced above are simulated. We consider a 64-ary QAM multi-antenna system. The transmitting and receiving ends each has 4 antennas. The sampling rate is f s = 4 MHz. Rooted raised cosine (RRC) filters are adopted in both the transmitting and receiving ends. The roll-off factor is α = 0.02. The rate of sampling period and symbol period is 2, and the order of RRC is 16. The effects of different factors on the transceiving performance are shown in Figures 4, 5, and 6. As is shown in Figure 4, symbol error rate (SER) gets a sharply increase when the narrowband phase error starts rising. Comparatively, the amplitude error puts a much less influence on it. Figure 5 displays the effect of wideband amplitude and phase error. When the channel fading is small (i.e., b1 = 0.01), the situation is very similar to the ideal case. However, just a little increase of the fading can lead to the rapid rise of SER much less a large value near 1. The amplitude and phase error caused in I/Q channels are measured by another criteria error vector magnitude (EVM) as it is shown in Figure 6. Yet the amplitude error and phase error both have a drastic influence on the transceiver's performance. 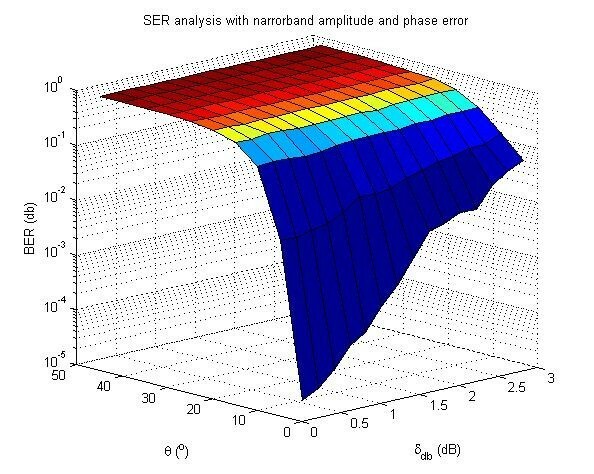 SER analysis with narrowband amplitude and phase error (SNR = 5 dB). 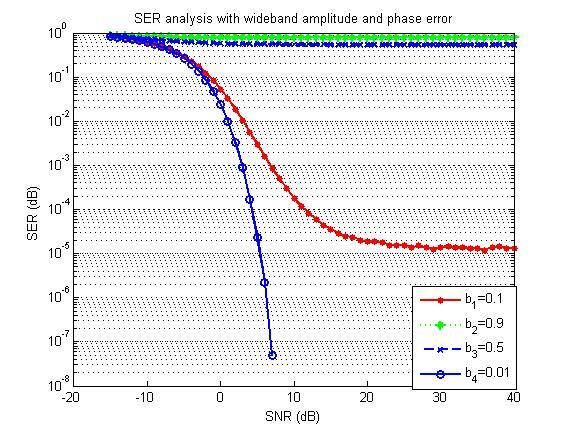 SER analysis with wideband amplitude and phase error. 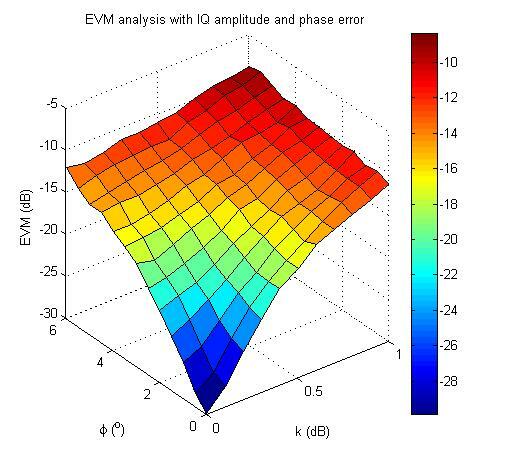 EVM analysis with I/Q amplitude and phase error. The following simulation results verify the compensation ability of AO-LMS. 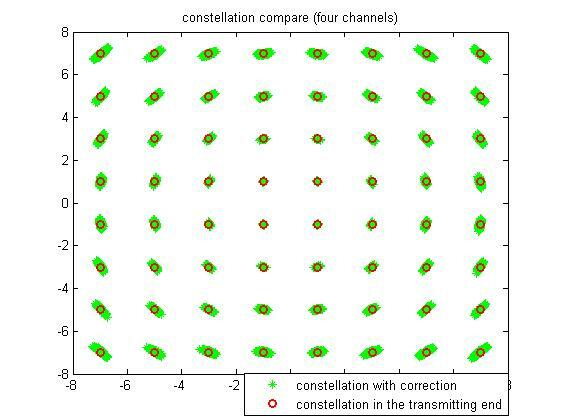 Constellation before and behind the block of phase noise compensation are shown in Figures 7 and 8. In the view of constellation, the signal with phase noise brings a circular change along the amplitude circles. It is distinctly presented when SNR is large enough. Figure 8 shows that the algorithm adopted can take an apparent clustering even if large Gaussian channel noise exists. On the other hand, as is shown in Figure 9, the symbol error number can decrease sharply to less than one-tenth compared to the number before correction and at least one order of the SNR (dB) is gotten. Furthermore, the algorithm is adapted to engineering application due to its less tap number. The tap number used in the simulation is 16. Constellations without and with phase noise compensation (SNR = 15 dB). Constellations without and with phase noise compensation (SNR = 7 dB). 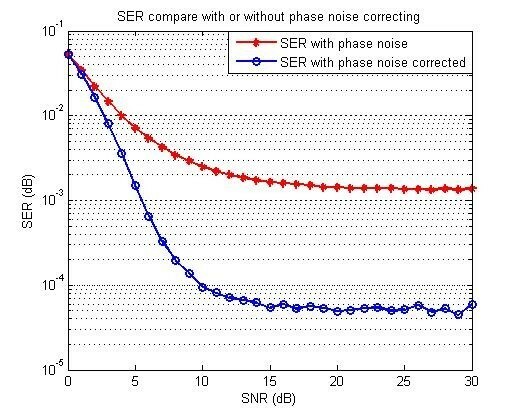 SER analysis before and behind the phase noise compensation. Aiming at analyzing the transceiving beam forming systems, some imperfect factors are considered and analyzed theoretically. 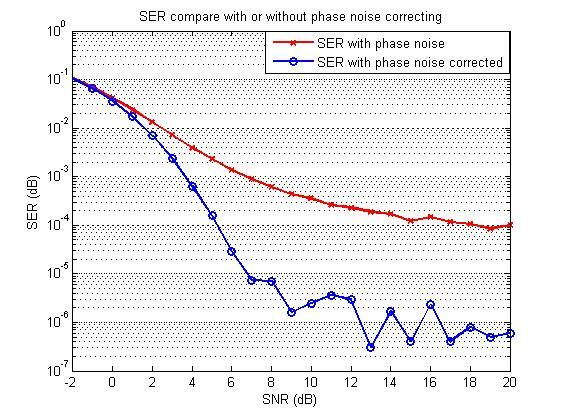 Phase noise is presented as a more inevitable factor. An effective compensation method is presented and verified by simulation results. The authors would like to thank the support of Fundamental Research Funds for the Central Universities (ZYGX2010J015).